NordFX is an online brokerage company, based in Vanuatu that was established in 2008. It now serves clients from more than 100 countries and using the popular metatrader 4 and metatrader 5 platform is manages to offer high-quality services for spot forex pairs and crypto currencies. Even though it is a broker that is not regulated by well-knows agencies such as FCA, there is no doubt about the reliability of the company and people skeptical about that can check the awards section on the broker’s webpage. What stands out from the list above is the crypto account, which offers the ability to trade bitcoin, ethereum and litecoin CFDs with a 3:1 leverage seven days a week. As a whole, NordFX offers competitive spreads and low minimum deposit requirements. They also have multiple choices for trading platforms and you could easily find one that suits for you. A wide variety of trading account is also a positive aspects which should be mentioned. A slightly negative aspect is the limited number of trading assets. NordFX focuses mainly on Forex, precious metals and crypto currencies. NordFX relies mainly on the metatrader 4, but also on the metatrader 5, an improved version of mt4. They’ve also developed versions for iOS and Android and a multiTerminal platform that can suit if you need to manage more accounts at a time. NordFX had a live chat support that is available 5 days a week, email support and also phone support. It has three phone numbers available, which you could find on their website, for China, India and Russian Federation. Summary: NordFX is an online brokerage company, based in Vanuatu that was established in 2008. It now serves clients from more than 100 countries and using the popular metatrader 4 and metatrader 5 platform is manages to offer high-quality services for spot forex pairs and crypto currencies. 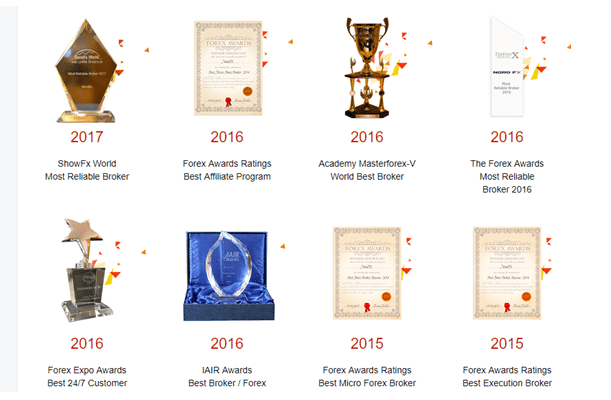 Even though it is a broker that is not regulated by well-knows agencies such as FCA, there is no doubt about the reliability of the company and people skeptical about that can check the awards section on the broker’s webpage.